This is the real thing. Horse POWER! Using workhorses and tapping into their strength to help get the job done. I’ll explain the story of “why” in the following section, but as you’ll see, it’s not hard to learn, comes naturally to many horses, and is a great way to get the job done, simply, without relying on modern machinery. 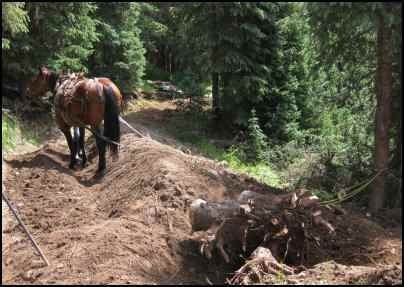 Most of our Horse Power work is moving dirt and rock, digging ditches and building up a bank. 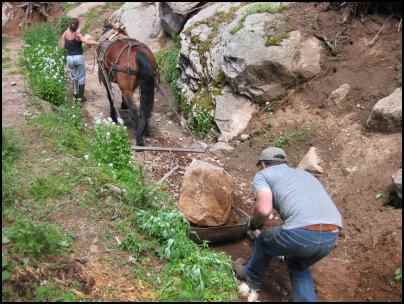 Through our work, we’ve learned to pull logs, stumps, tarps, rocks; dig and plow; from the saddle or from the ground, with the help of our horse. Or I suppose I should say “the mighty force” of our horse. He makes it look easy and makes light work of what—without some gas-powered equipment—would be back-breaking labor. And the best part is, all this work is easy on the ears, the environment, and the wallet… It’s a lost art we are proud to be keeping alive. So, through what we’ve learned in the past three years, with a couple people, one horse, and some ingenious creativity so common among homesteaders, I’d like you to consider the possibility of horse power, going far beyond digging a ditch as we may be doing; seeing what else this power can be used for, from turning a garden to plowing a field, hauling wood to the fire or logs to the cabin site. It’s amazing what we can do with the power of the horse. I’m a homesteader in the high mountains of southern Colorado, operating a seasonal guest ranch at our home to try to make a living. I live this life because I love it. Working the land. Working with my family. Working with my animals. Able to be here and make it work out. Not always perfect, but pretty good. Challenges are a part of it all, aren’t they? I’d imagine you feel the same way, or at the least, are learning and moving closer to the land each year. My husband, son and myself are outfitters in these mountains. 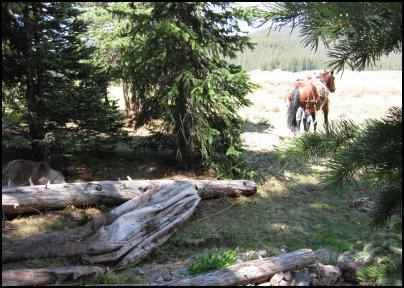 We guide folks on horseback rides and trips in the Wilderness. But when the trend for ATVs increased and the demand for horses decreased, we were stumped. Like any homesteader worth their weight in salt (strange expression, as I’m thinking salt is pretty cheap nowadays), it was time to adjust and make do, to find a way to make it work out—always a good challenge. In this case, the challenge was figuring out how to make our horses still “pay their rent;” to find a job to do with our horses. Great. Well, digging by hand, we knew how to do. Between plenty of post holes and raised garden beds, we considered ourselves rather experienced with the shovel. But using our horses to dig? To pull? To break and move dirt? We had no clue. We started by talking to an old timer who’s one piece of advice still remains the most essential—Safety First. When you ask that horse to stop, he better stop. Those feet must never move when he’s hooked up unless you tell them to. OK, so my little Arabian stud horse was out. Then, we ordered a used book on-line called “The Draft Horse Primer” by Maurice Telleen (Copyright 1977, published by Rodale Press). This provided us with some technical information about the tack or gear we’d need to learn about and actually use. There’s far more info in that book than I’ll ever understand, but it sure helped answer our questions and get us started. Yes, we started out pretty green. Instead, we chose our big paint-horse, Carlos, the largest of our dude string geldings, a gentle 6 year old at the time. Figured size was important. First, we spent time getting him comfortable with the rope behind him, just letting a long 20-foot rope drag, allowing him time to get used to feeling it on his legs, beneath his tail, even getting his legs tangled in it a little bit without panicking. Then we added some weight to that pull. At the end of the rope, we attached a tire, let the horse see what was going on back there so that fear of the unknown would not be an issue, and rode him around while pulling that tire dallied onto the saddle horn. At the same time, and uncertain of the conditions in which we’d have to work at the ditch job, we taught this riding horse about driving by clipping two 20 foot lead ropes to the snaffle bit, one on each side, looped through the stirrups, and driven from a safe distance behind. As Carlos was already well trained and well seasoned as a riding horse, this was an easy lesson for him to learn, and the simple commands of forward, left, right, and stop were soon mastered. From there, we began driving him while he was pulling a load, a load we slowly increased in weight and bulk. I think we ended the lesson with the horse pulling my father-in-law hunkered down on a big old spruce tree stump around the corrals. And stand and wait that horse does. With every “Whoa,” his feet are planted, and patiently waiting the next job at hand. 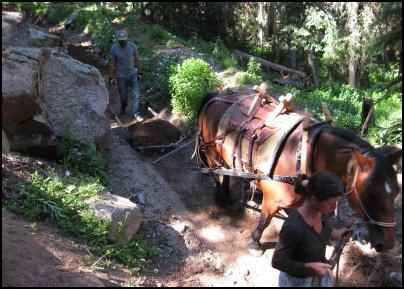 We’ve worked with our draft horse, Gizmo, for three years now, pulling innumerable objects and loads of dirt and rock. Never a wreck! This work just comes naturally to him. And on a side note, we feel the work, the regular use, has been essential in his cure and avoidance of founder. Sure, you can teach any horse to do any thing. But some things come easier to some horses. Why not pick the right tool for the job? The next order of business was figuring out equipment. We started with the collar, probably the most important piece of equipment as this is the part that must fit the horse properly and distribute the weight evenly. The fit of the collar is one of the most essential parts of the whole set up. The collar takes the brunt of the weight of the pull and evenly distributes it around the powerful front end of the horse. The measurement for the collar is taken on the inside of the leather, from top to bottom. Well, we drummed up an antique collar that my father-in-law had been using as decoration, hung on the wall in his summer cabin (though this one had been well used by him and his horses back in the day…). The collar was a small 19” one, and it fit the Paint horse perfectly. The best way to find the right fit is to try one on for size. There should be space only for one hand to slip in snug between the base of the collar and the chest of the horse when properly fit. When pressure is on and the horse is pulling, the collar will fit back against the chest of the horse, and pressure will be put throughout their chest and shoulders. Check your horse after every work session for any chaffing or abrasions or marks that might indicate uneven pressure and improper fit. A well-fit collar should result in no rubbing or sores what so ever. This should be an absolute requirement. When we switched from Carlos to Gizmo, the Percheron/Quarter Horse cross gelding, the old antique collar was too small. We ordered a new one based on fit and measurements from the old one. We ordered on-line through a company called Smucker’s Harness Shop. There are not a lot of shops up on this mountain to choose from, but I don’t mind taking the time to compare prices and services on-line. The cost, including shipping, was under $150. We were (and continue to be) pleased with the product and the price. The next thing you’ll need is the hame. This is a pair of curved pieces of wood or metal that fit into the collar just so, and onto which the strapping will be connected. The fit of the hame is important too, but most of these are somewhat adjustable. After and coming from the hame, you’ll need your harness and hitching. You can get real fancy and elaborate here, or you can keep it simple, and sort of makeshift with what you have and what you need. What you’ll need is the trace, or straps that attached to the hame, and lead down at an angle, strapped to the saddle or rigging for security, then down the single tree, plow, slip, or whatever you’re hooking on to work with here. We ordered a used hame and a work harness from an on-line auction. Turned out to be designed for driving, but they were heavy duty enough for our needs, and the price was right, so we were able to make it work. That brings us to the next piece of equipment. 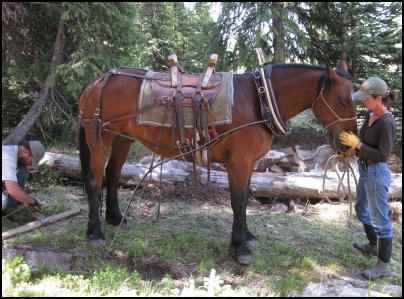 You can buy a special harness for pulling, or you can do what we did and use a riding or pack saddle. Both have proven to work just fine for our needs. For our work in the ditch, most of the time it’s easier for me to lead the horse, and therefore we just use the pack saddle. The pack saddle also works great when we have a mile or so to “commute” from our camp to the work site. We just pile up our gear, tools, and lunch in a pair of panniers and have the horse carry them to the job site for us, just like a multi-purpose tool. From the hame and over the saddle or harness, you’ll attach the trace. 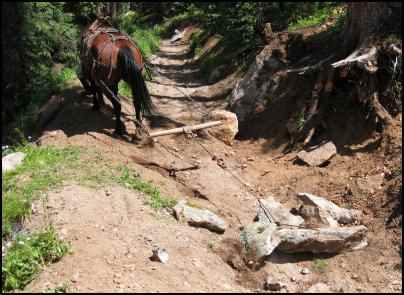 At the ends of the trace, which is the strapping that goes from the hame, down along the side and then behind the horse, there should be links of chain on which to hook whatever tool you’ll be using here, be it a plow, a slip, or a rope, chain or choker attached to a single tree. We bought chain length in bulk and made sure we had a long enough length at the ends of our trace. Extra chain always comes in handy for hooking on logs, stumps, roots or what-not onto your single tree. You’ll want to keep an eye on the angle of the trace coming from the hame down to the point of pull. 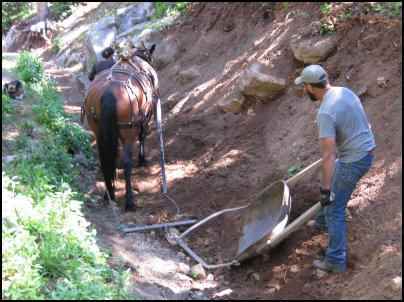 The point of pull (where your slip, plow, single tree, or choker connects) should be far enough away from the back feet of the horse that he will not tangle, but close enough that there is not unnecessary drag. Use old strapping and rigging from old saddles, backpacks, etc. to make strapping for the trace, adjustable to get the right angle. Make your straps easy to clip on and off of the rings of the pack or riding saddle. When you’re not working or pulling, you can wrap the traces around the saddle or clip them together so they do not drag unnecessarily. Again, scouring the antique shops, or in our case, decorations on the wall, a single tree is a useful item to find and use when working with the horse. The single tree keeps the pull load evenly distributed between sides of the horse, and also keeps the trace and chains separated at a good distance so that the horse does not step into and tangle in his rigging or load. Slips and plows in this neck of the woods are often found at thrift shops, yard sales, farm auctions, antique sales. These things are sold for cheap—most folks only want them as yard decorations. Chances are, very few folks want to use these tools for their intended purpose! There is no sense in buying new. The old ones were built to last, and if the parts and pieces are all in place when you find it, chances are pretty good you won’t break it if you try.